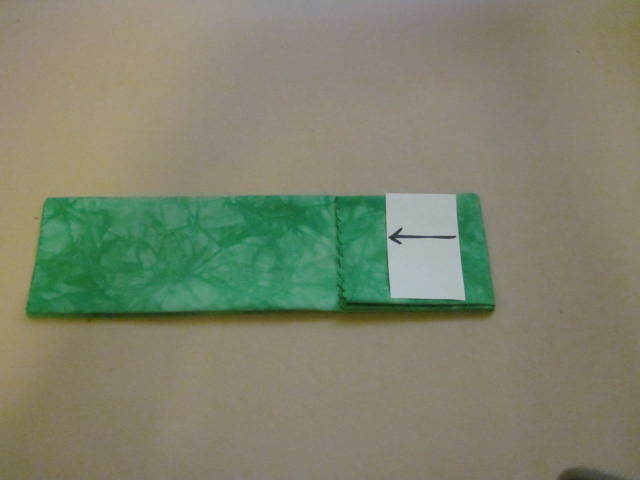 Have you ever used a strip of Wash tape to embellish a card, or add to your journal page or scrapbook? They’re beautiful, but although they’re not terribly expensive, if you want a variety to choose from it can add up. Plus I never seem to have exactly the color or style I want. Well, my friend Carol gave me a tip for making my own…and Since I already had everything I need to make them, I had to try it and share it with you. Any glossy magazine page will work. I have plenty of quilting magazines, catalogues and flyers. 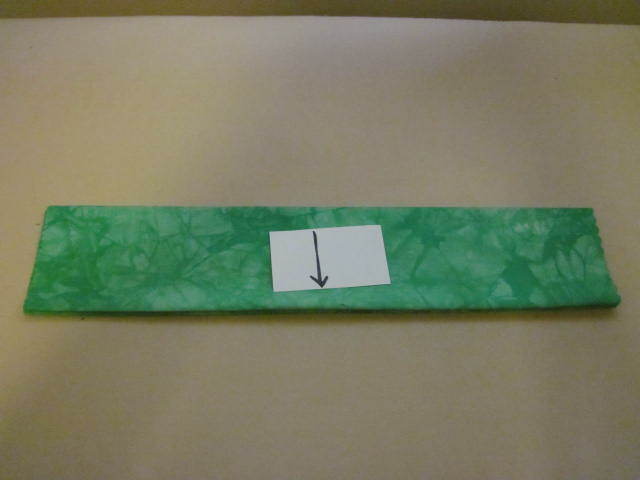 To begin, simply tear off a strip of tape (whatever size you want) sticky side down over the top of the picture. It can be a pattern, words, some flowers, leaves…whatever design strikes your fancy. Here I chose a section of a quilt photo from a catalogue. 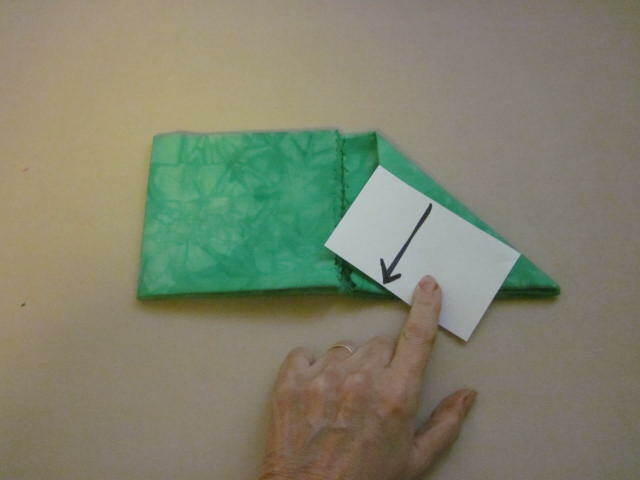 Burnish the tape by rubbing it with your fingernail or an old credit card. 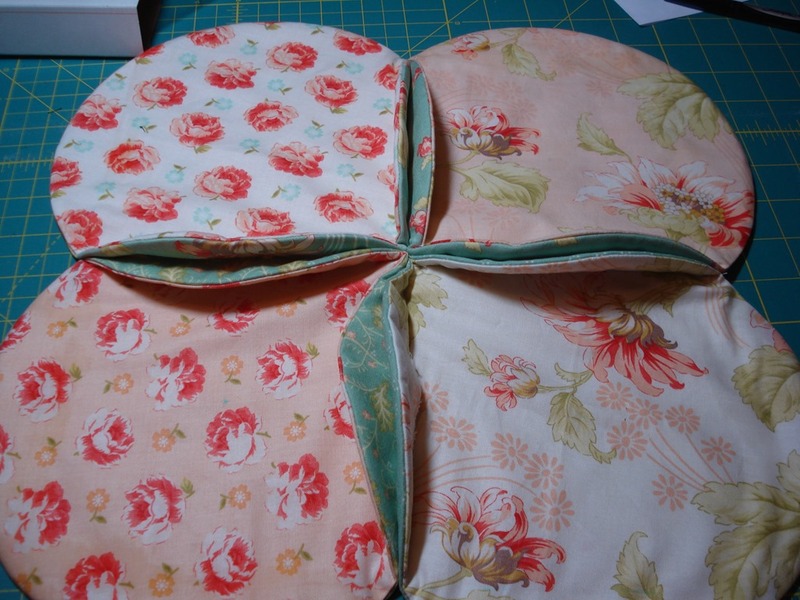 As a quilter, I happened to have a seam roller for pressing down seams…and it worked great. The object is to get the tape stuck down firmly without any air bubbles. 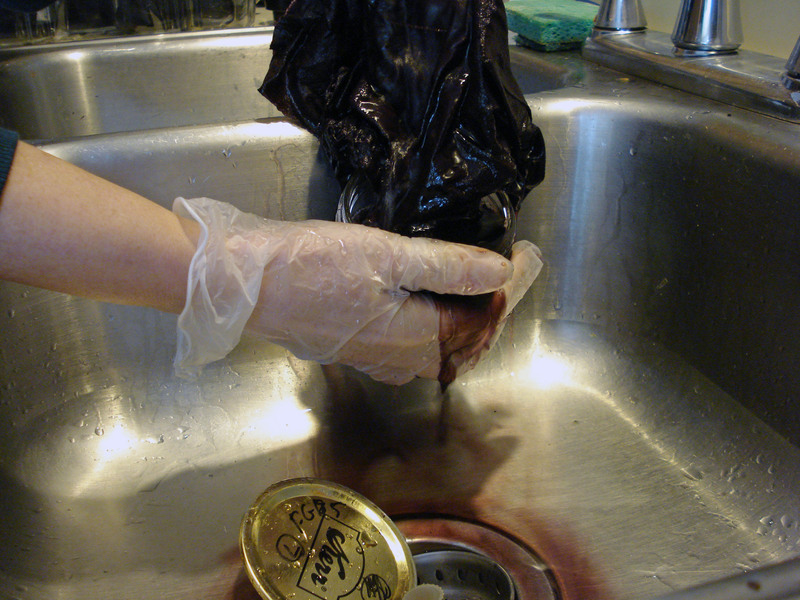 Then place it in a bowl of warm water. You can tear off the extra magazine page around it first if you like, but it’s not necessary. Here I put the whole page in. Wait for a few minutes. The tape with the image attached will slip away from the rest of the page. The paper backing slides off the back of the strip of tape completely, but magically leaves the color image transferred to the tape! It becomes part of the tape and is translucent. 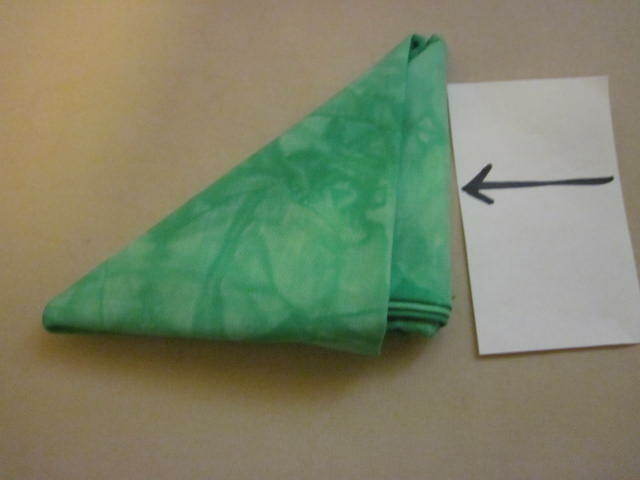 Lay the individual tape strips on a clean towel to dry for several minutes. 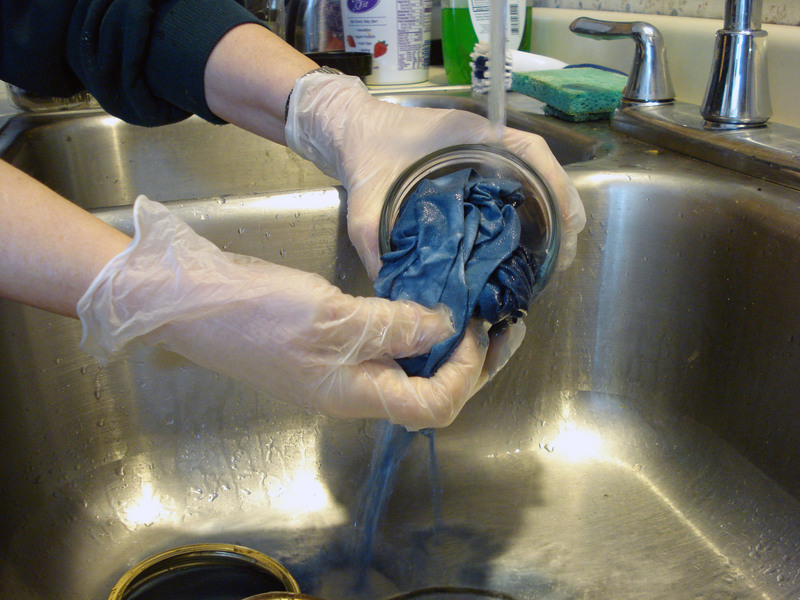 At this point they’re not very sticky, but there may be just enough glue residue left on some strips that they’ll lift up some fiber if you lay them on paper towels–which you don’t want–so a fiber towel is best. And ta-da! … you have the equivalent of (non-sticky) washi tape strips to use to decorate your cards and scrapbook pages. To make them sticky, just run a glue stick across the back of the strip when you’re ready to stick them on your page or card. Or you could use any scrapbook glue. Or (if you have one) you could even run them through a xylon stickermaker. Here are a few of mine.. Some are bright, and some very subtle (like the leaves above). They do tend to curl a bit after they’re dry, but I’ve discovered a way to straighten them. 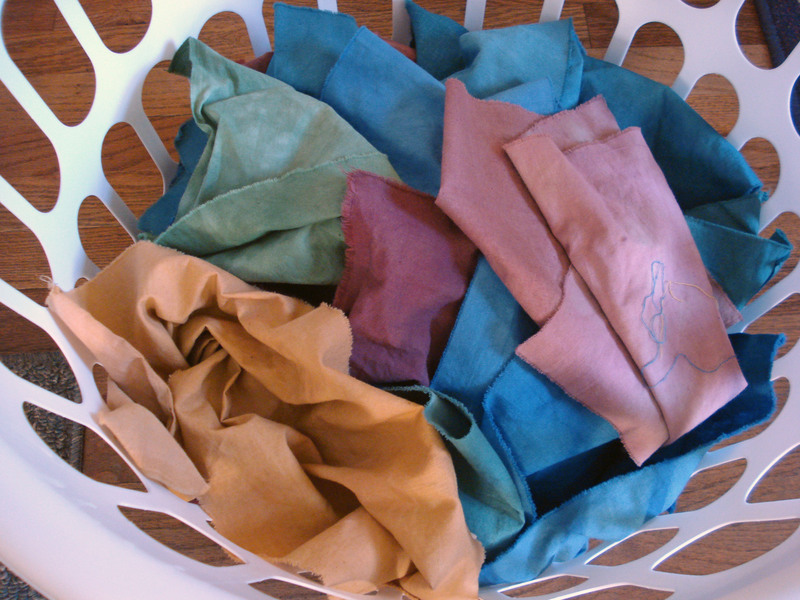 Take two sheets of parchment paper–the kind used for baking. 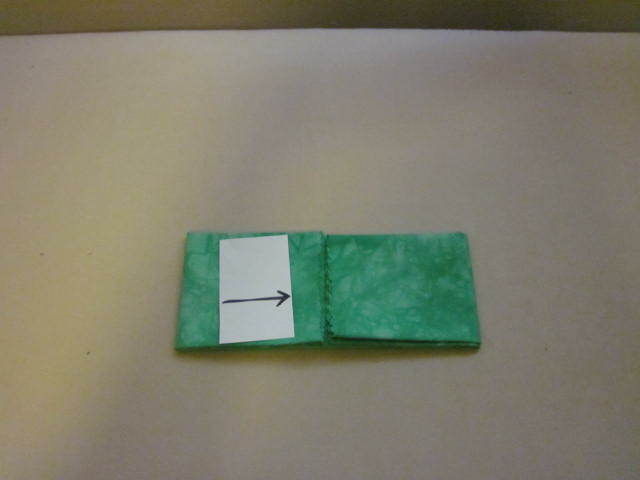 Put one on your ironing board (to protect it) and place the strip on top. 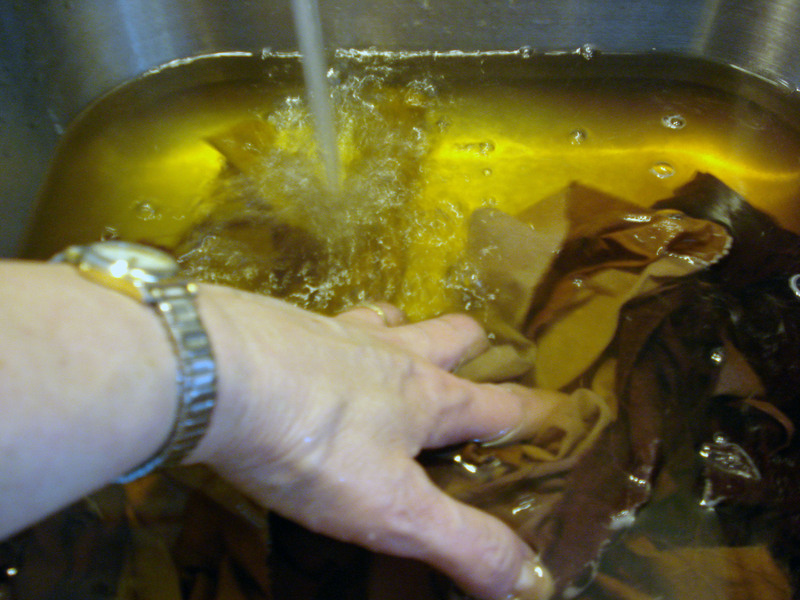 Then cover that with the second piece of parchment (to protect the iron) and iron for a few seconds. I understand that besides using pages from magazines or flyers, that this technique will work on anything printed on a laser printer. Since I don’t have a laser printer, I can’t verify how well that works, …but if you have access to one, it would be a great way to make your own washi tape phrases or quotes, …or print out your own photos and computer-generated designs to use. Hope you’ll give it a try. So I’ve been debating whether or not to buy one of the new fabric die cutters available out there…I wondered… Was it really worth the price? Would it really save me time? After watching a b’zillion videos on the Accuquilt website, and an in-person demo at one of my fabulous local quilt stores, Mill House Quilts, I was “hooked”. 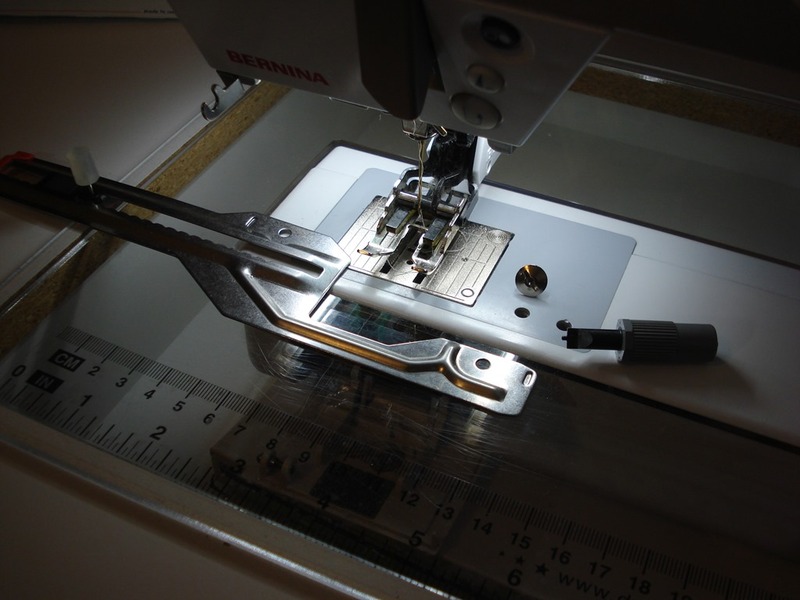 It wasn’t the time saved or even the “rotary cutting wrist relief” that sold me on them… It was the consistent accuracy of the pieces the Accuquilt dies cut. There are several sizes of Accuquilt Die Cutters (ranging in price) for me to chose from. I felt a little like Goldi-locks–this one’s too big, this one’s too small, this one is just right! I felt for me the Go!Baby was a bit too small. I wanted to use the larger strip cutting dies, and the Baby only accepts the small dies. On the other end of the spectrum the Go!Big Electric was too much for my small sewing space. It would be a great choice for people with hand issues that can’t handle the manual crank. And the Studio (the top of the line and most expensive) was way over my needs, space, and budget. So I settled on the Go!. It can handle the larger dies, but is light-weight and easy to fold up and put on the floor under my cutting table when not in use. Very easy to bring up and use anytime. Of course I waited until it was on sale, and it came with a “Value Die” (55018) a 6×12″ cutting mat, die pick, and pattern booklet. I also bought the 1-1/2 inch strip cutter–thinking ahead to log cabins in my future (yes!). I’m in the process of making a baby quilt for a friend (soon-to-be grandma again) that has 4″ finished Signature Blocks. 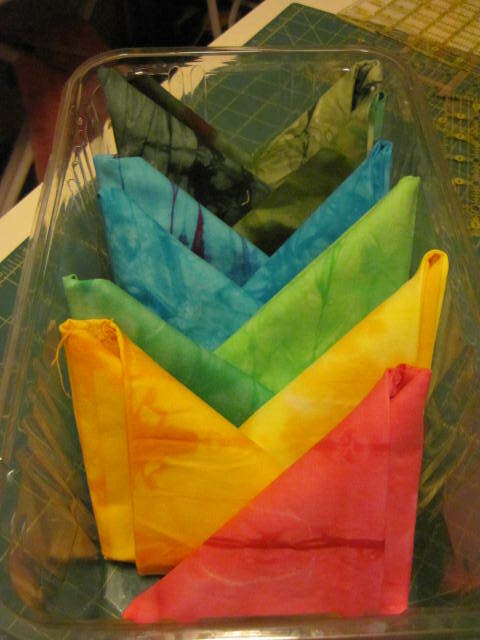 To create the two corners of the block, I need 2″ finished half square triangles, and I happen to have this die (yay! It’s part of the “value die”). To make the cardboard template, I measure and add about a quarter inch or so on each side all around that particular die and cut it out (with paper scissors). 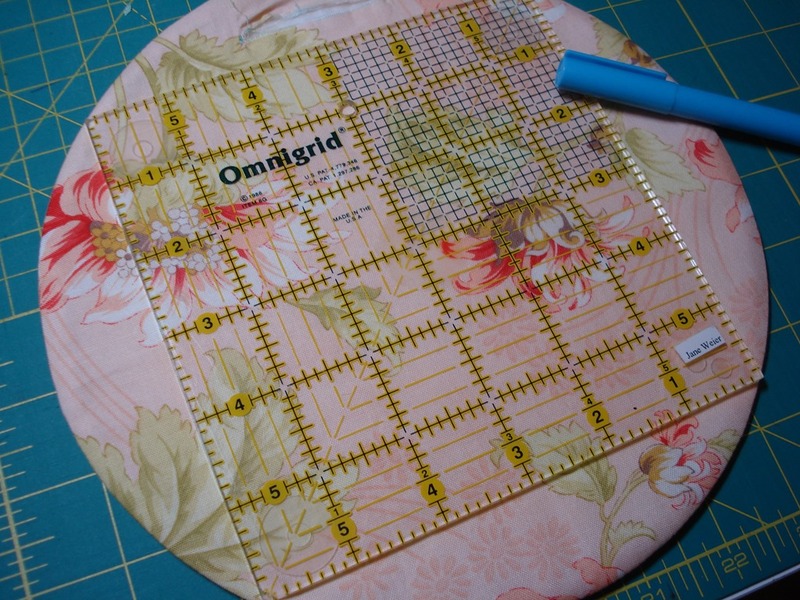 Then whenever I use that die, I can use this template to help me visually prepare the fabric so it’s not too large or small and I can make the most of the fabric strip or scrap from my stash. 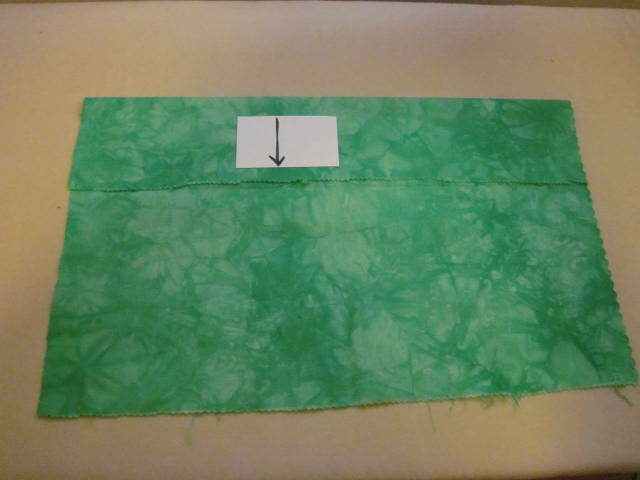 **IMPORTANT**: Don’t forget to slip the cardboard template OUT of the fabric before you take it to the die cutter! –you do NOT want to run the cardboard template through the die cutter with the cardboard inside!! It actually didn’t take long at all! From beginning to end I cut 24 perfect half square triangles in about 2 minutes. The best part (and the real reason I was hooked on a die cutter) is the accuracy. Each triangle is perfectly cut. And even better, all the “dog ears” are cut off…making piecing a breeze. Between then and now (my birthday was in there and the family knows what I want–LOL), I’ve accumulated a few more dies. I plan to make templates for all of them except the very large strip cutters. That’s all for today… I hope this was helpful. I’ll share the quilt I’m making with you next time. HAPPY THANKSGIVING to all my friends in the U.S.
I’ve been eyeing a special attachment for my Bernina sewing machine for quite some time. I was at Mill House Quilts in Waunakee this past week, where they have all the newest Bernina sewing machines along with a great assortment of attachments and feet. 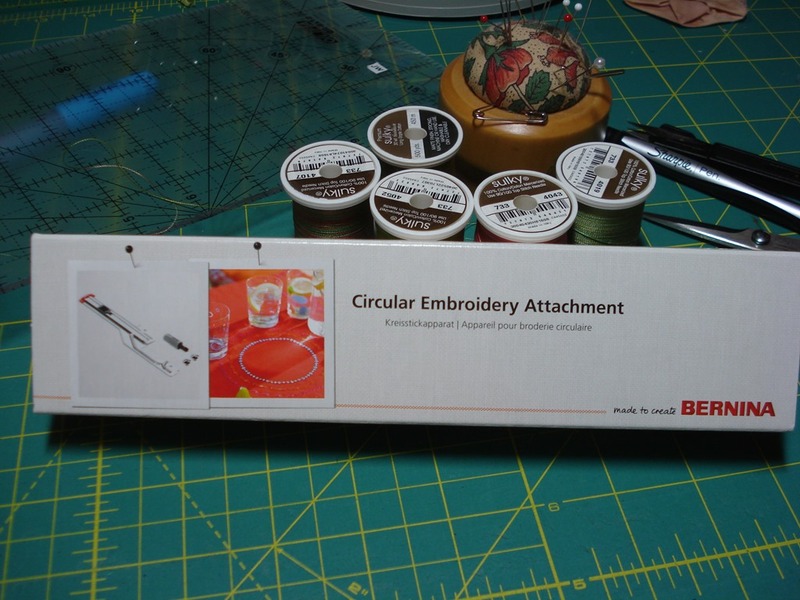 Then I saw it, they had it in stock!, so I finally decided to buy it — the Circular Embroidery Attachment. (cue the trumpets) Ta da! The attachment comes with 2 screws and a nifty small screwdriver, and attaches to the bed of my machine with one screw in the hole on the right of my pressure foot. One video suggested taping the other end near the pin to be sure it doesn’t wiggle (which I did—see blue painter’s tape in the second photo below). There’s a sharp pin under that plastic nob on the left of the tape (see above). You carefully take off that plastic bit and poke the center of your fabric through the sharp pin and replace the plastic bit, and that’s all there is to it. You place the fabric under the pressure foot and “step on the gas” and it glides around in a circular pattern all on its own with little help from you. 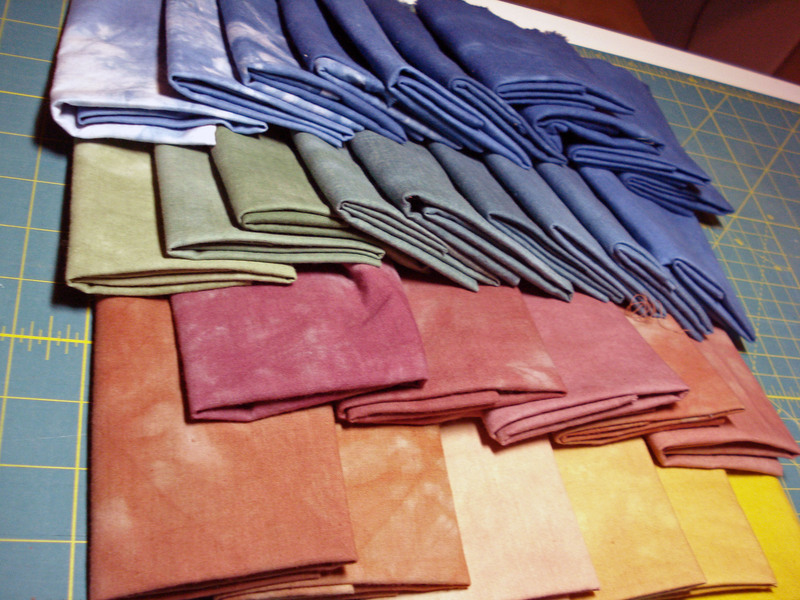 You do need to stabilize the fabric so it doesn’t wrinkle and bunch up, but if you’re doing the project I’m doing, it’s not necessary. The directions recommend using a open embroidery type foot, but since I’ll be sewing through a few layers with batting I’m using my walking foot. 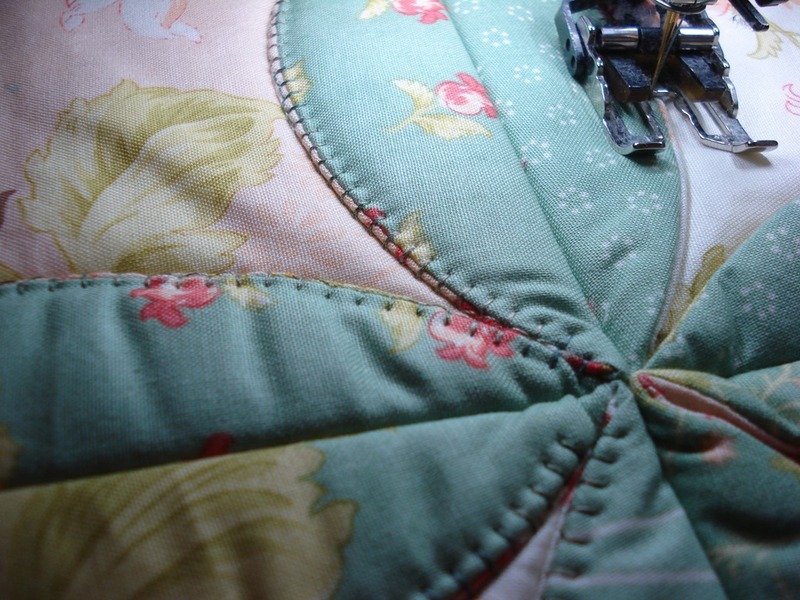 The pin is on a sliding mechanism so that you can adjust the size of the circle you want to sew. The distance between the pin and your needle x 2 = the size of the diameter of the circle. So for this particular project, I measured and slid the pin at a distance from the needle so the circles would measure around 8-1/2 to 9 inches. 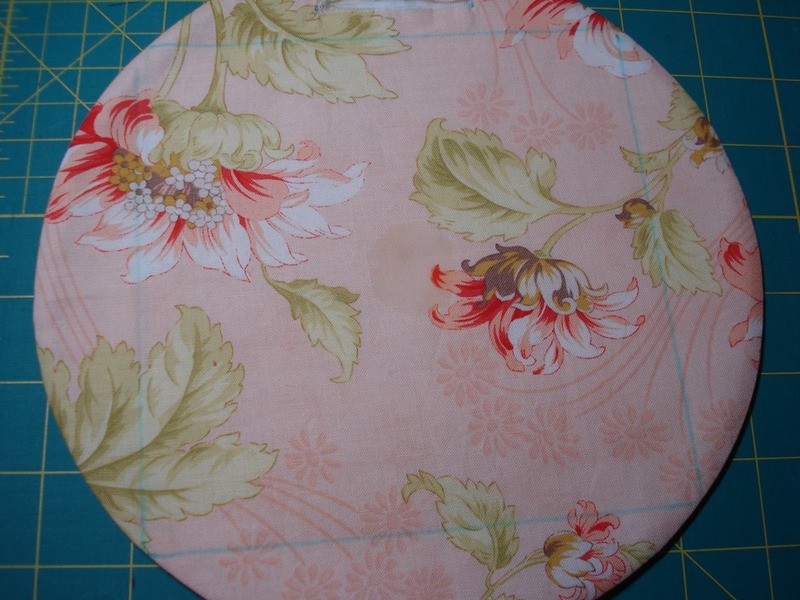 So here’s my first project using the Circular Embroidery Attachment – A Four Circle Table Topper. I went through my stash of unused layer cake squares and chose 8 coordinating fabrics (4 peach/pink and 4 mint green), and cut 4 squares of batting to match. Then I layered them starting with the batting on the bottom, mint fabric face up, then peach/pink fabric face down (so the 2 fabrics are right sides together). Line them all up and use your ruler to find the center and mark a dot lightly with a water soluble marker (or other washable mark). 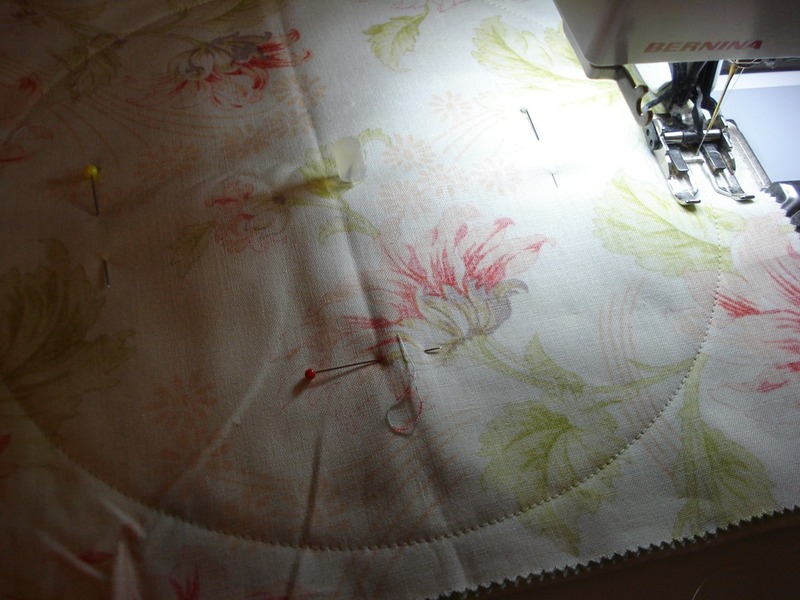 Then take it all over to your sewing machine and put the pin of the circular embroidery attachment through all the layers at that center mark and feed the right end (edge) of the fabric under the pressure foot. It’s so easy! It walks (sews) itself around in a perfect circle and comes back to exactly where it was started. LOVE IT! 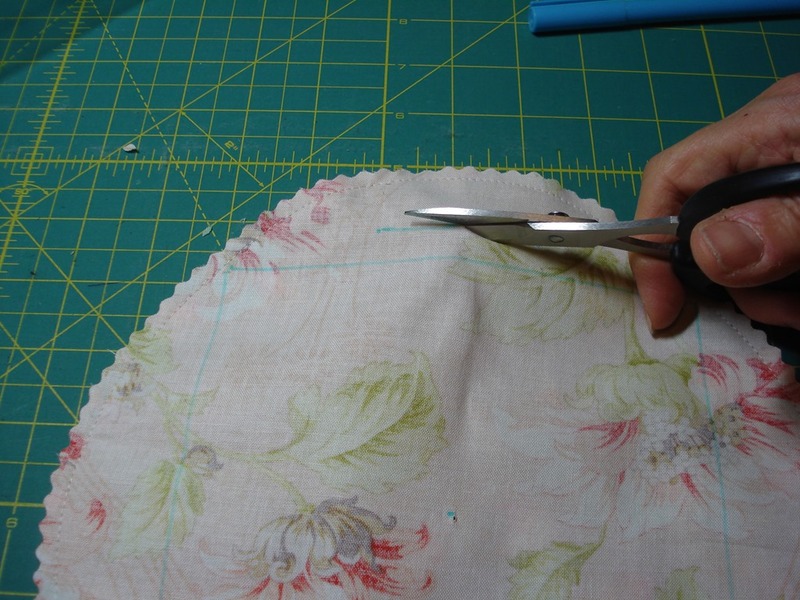 After trimming around the edges with a pinking shears (or pinking rotary cutter if you have one), you cut a small slit along an edge being sure to only cut the top fabric. 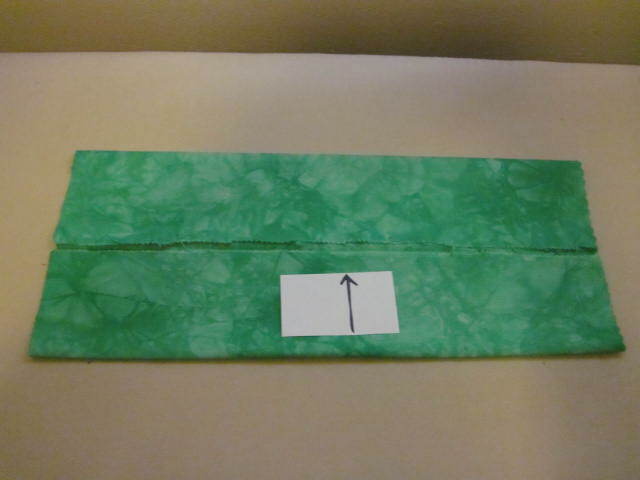 Be sure the cut slit is in a spot where the fabric will eventually be folded over (so the it will be hidden). Then turn the circle inside-out, using a blunt ended tool (like a bamboo paper folder, purple-thang, or bamboo skewer) to be sure all the edges are nice and crisp, and press. OH, you might want to use a tiny bit of water to get rid of the water soluble mark you made in the center…you don’t want to permanently heat set it into the fabric with your iron. 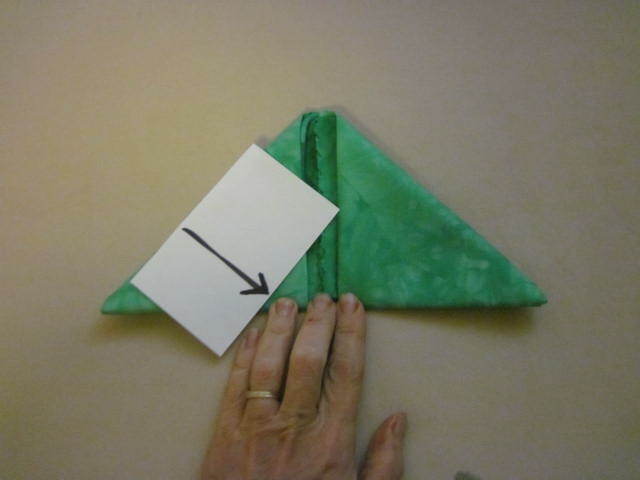 Use a ruler and a water soluble marker or chalk, draw a square box within the finished circle (being sure that the cut slit falls beyond the square in the outer edge (see top of the photo below). Each of the corners of the square should just touch the edge of the circle. I was lucky enough that my square ruler was a perfect fit. 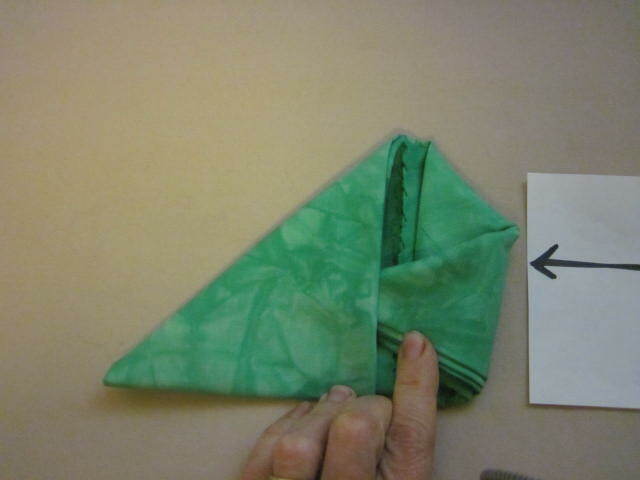 After making four of these, place them on a flat surface and see what arrangement you like best, turning up two edges on each one to expose the fabric underneath… it’s important that the “flap” that has the cut (used to turn them right side out) is in one of the seams so it’s covered. 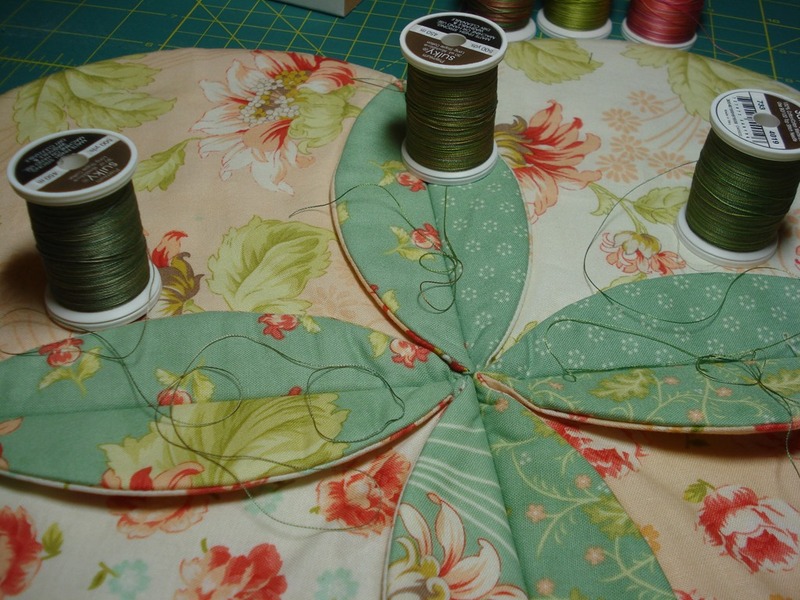 Then it’s similar to sewing a 4 patch together—Take the 2 upper circles and match them BACK to BACK using the drawn lines as a sewing guide, pin, and sew them together edge to edge, do the same with the lower 2. 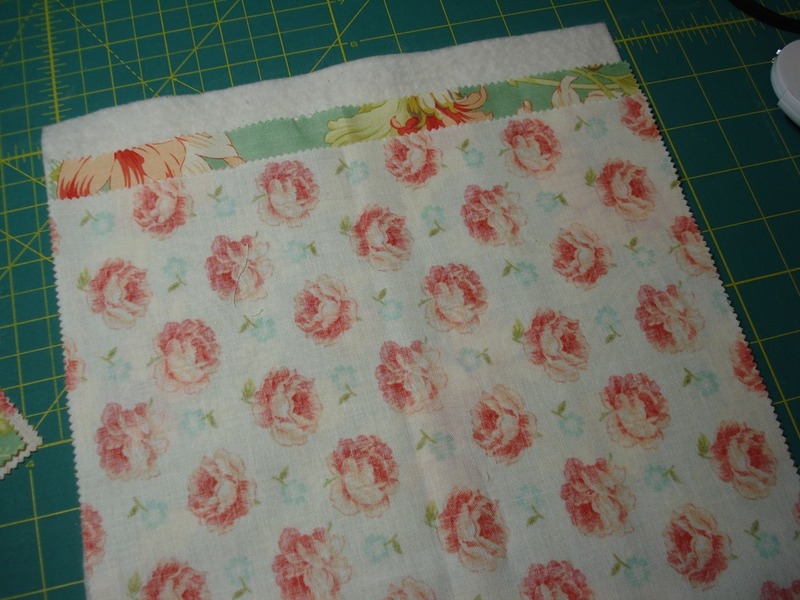 Then sew the top 2 with the bottom 2 and it will look something like this..
Iron the flaps down and use your favorite decorative stitch around each edge of the flaps (petals) to finish. 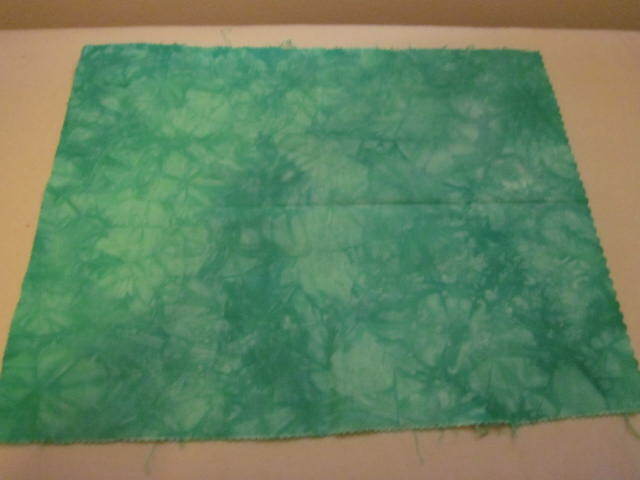 I chose a blanket stitch in green variegated thread, but you could opt to use a straight stitch, any decorative stitch, or just tack the flaps at each center point. You could even hand sew them down if you wanted to. You need to at least tack them down (or sew them) to be sure that the cut you made to turn the circles inside out is completely covered. 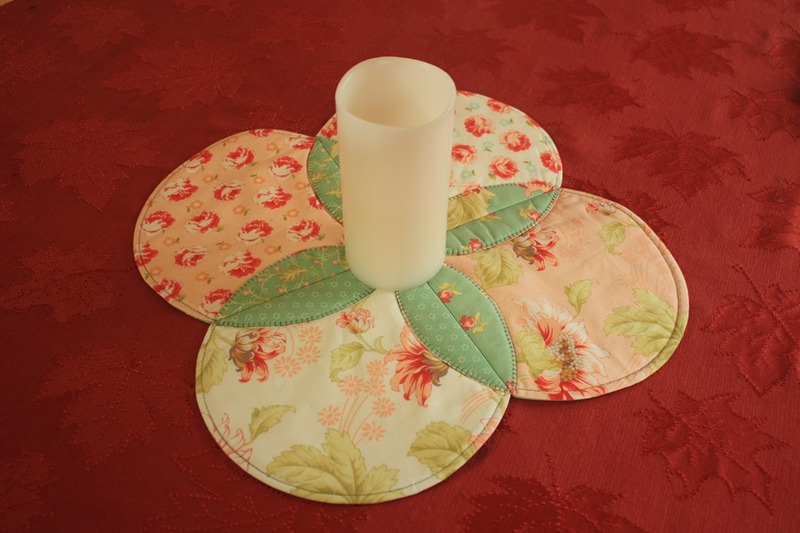 And no worries if you don’t have the attachment…you can create these table toppers by tracing a circle (using a platter or template) onto the fabric and carefully sewing on the line. That will work, but I’ve found this is a time saver, I can make any size circle, and just looks a bit better too. I think they make a wonderful gift—Mother’s Day is coming up. 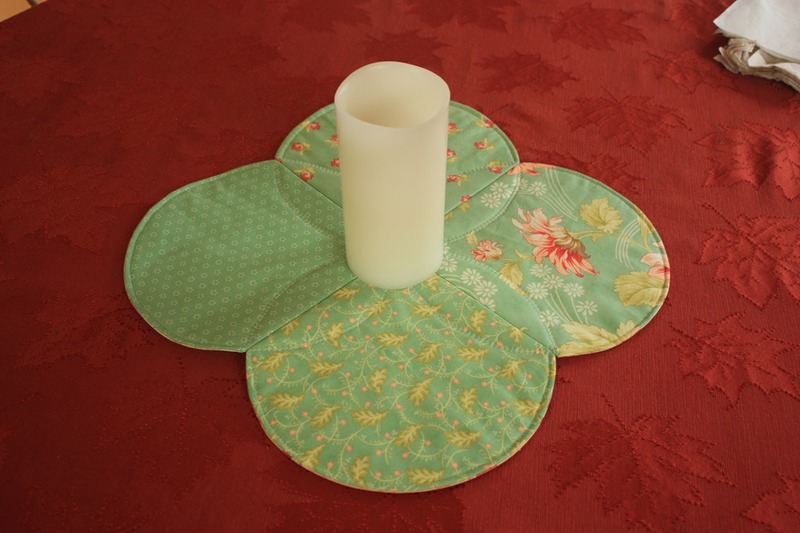 So I hope you enjoyed this tutorial, and that you’ll try making a reversible 4-circle table topper. I have them for sale in my Mulberry Patch Quilts Etsy Shop if you’d like to purchase one instead, along with lots of other ideas for Mother’s Day. 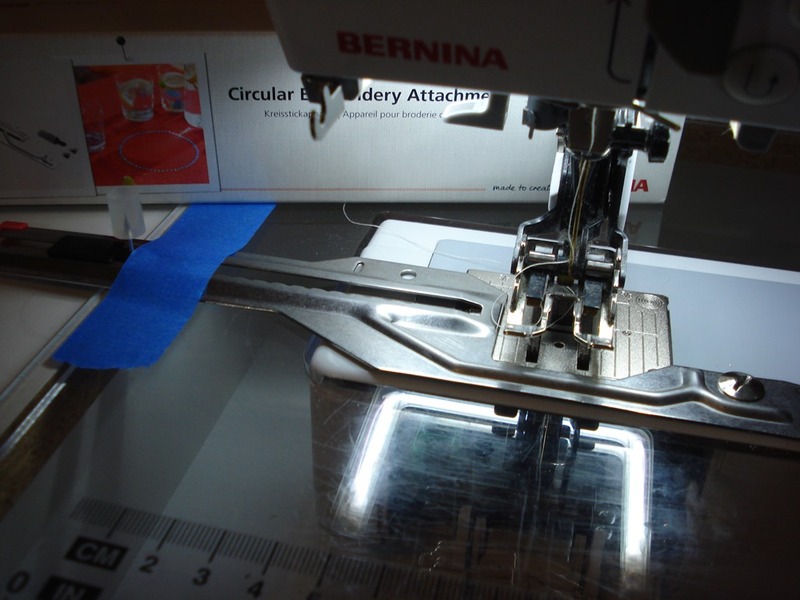 I’ll be posting other ideas for using my Bernina Circular Embroidery Attachment in the future…hope you’ll come back again! And be sure to post a comment below on how you use your circular attachment—any tips or ideas? 9. Tuck one corner into the other corner and there you have it! So, what do you think? 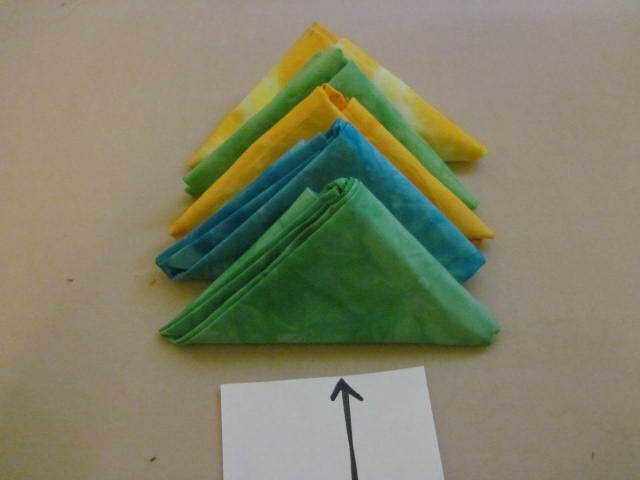 Do you have a fun way to fold your “fat quarters”? It’s so hard waiting…but the time is here. 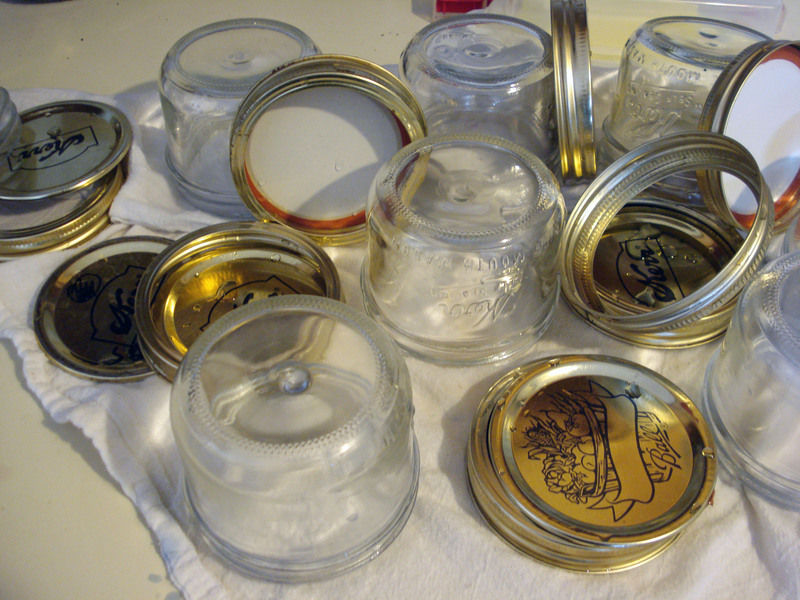 It’s been over 24 hours, and I can bring the jelly jars to the sink and wash out the fabric. Next is ironing with a hot (cotton setting) iron, and enjoying the “eye candy”!! 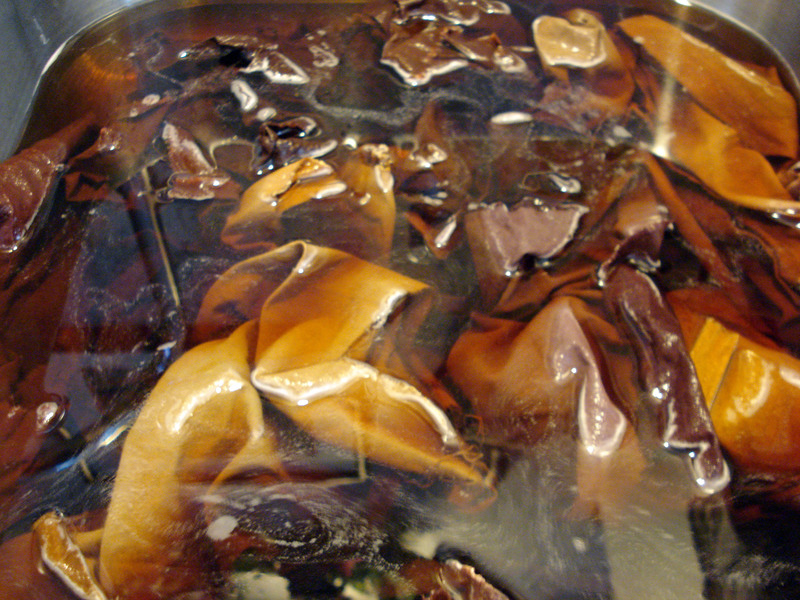 Also notice some were more “mottled” than others due to the way they were submerged in the dye. 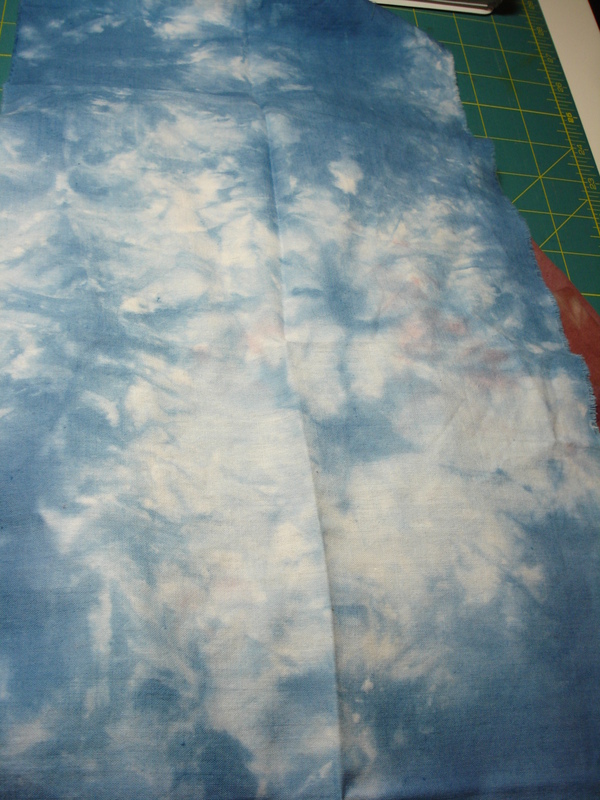 I have a couple that will make great sky fabric because the dye didn’t completely get into all the the tight little folds of fabric I scrunched into the jar. 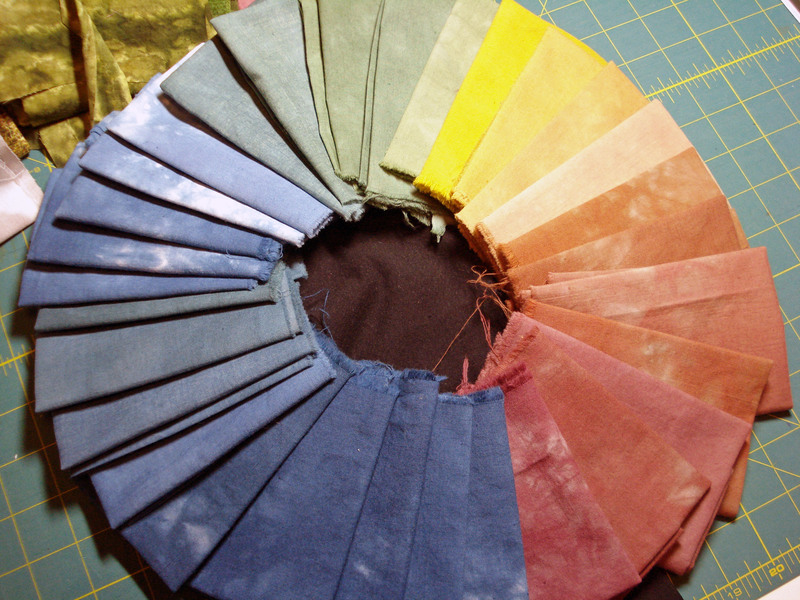 More colors to add to my stash for the next landscape art quilt! 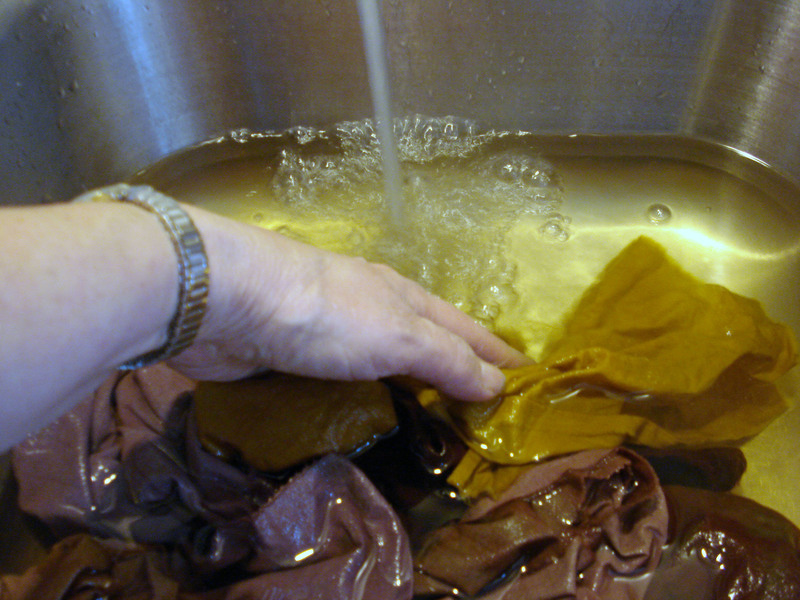 Maybe I’ll try using up the leftover dye concentrate I didn’t use to see if I can come up with some other exciting combinations. Next time!